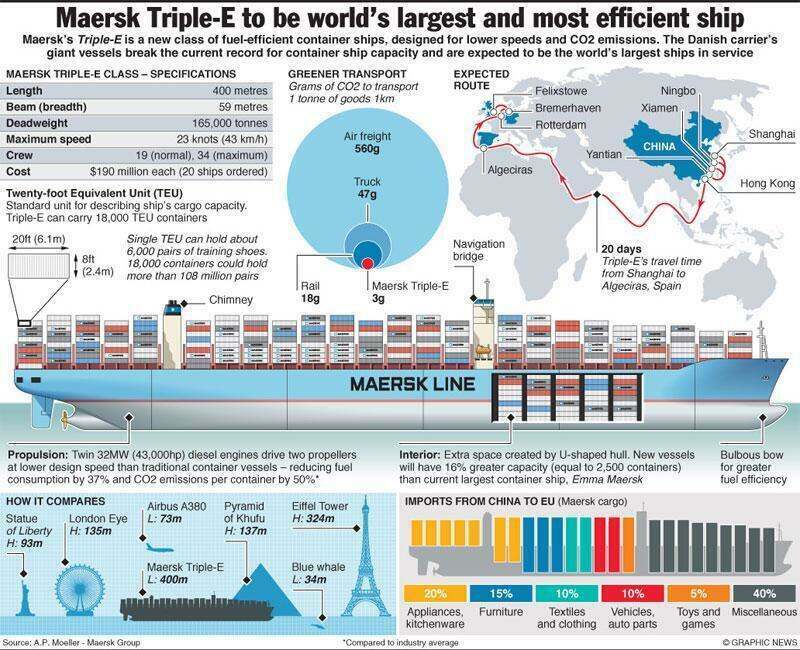 The Maersk Triple-E is the newest class of container ships. First built and delivered in 2013 (the first example being named the Maersk Mc-Kinney Moller) there are 20 total units planned (as of January this year, there are 7 units) with planned complete production in June 2015. Unlike conventional single-engined container ships, the new class of ships has a twin-skeg design: It has twin diesel engines, each driving a separate propeller. Usually, a single engine is more efficient; but using two propellers allows a better distribution of pressure, increasing propeller efficiency more than the disadvantage of using two engines. The engines have waste heat recovery (WHR) systems; these are also used in 20 other Mærsk vessels including the eight E-class ships. The name “Triple E class” highlights three design principles: “Economy of scale, energy efficient and environmentally improved“. The twin-skeg principle also means that the engines can be lower and further back, allowing more room for cargo. Maersk requires ultra-long stroke two-stroke engines running at 80 rpm (versus 90 rpm in the E class); but this requires more propeller area for the same effect, and such a combination is only possible with two propellers due to the shallow water depth of the desired route. A slower speed of 19 knots is targeted as the optimum, compared to the 23–26 knots of similar ships. The top speed would be 25 knots, but steaming at 20 knots would reduce fuel consumption by 37%, and at 17.5 knots fuel consumption would be halved. These slower speeds would add 2–6 days to journey times. The various environmental features are expected to cost $30 million per ship, of which the WHR is to cost $10 million.Carbon dioxideemissions, per container, are expected to be 50% lower than emissions by typical ships on the Asia-Europe route and 20% lower than Emma Maersk. These are the most efficient containerships in the world, per TEU. A Cradle-to-cradle design principle was used to improve scrapping when the ships end their life. As noted in the infographic the transit from the China to Europe takes 20 days. Maersk is hoping the increased fuel efficiency will offset the increased transit times. You can learn more at Maersk’s Flickr site and at the Triple-E’s website. It’s going to be interesting to see how these vessels will change the current maritime security environment. Seduced By Success; An Army Leadership Untrained for True War? Our friend at Op-For, the urbane and erudite sophisticate LTCOL P (supplying some cogent comments of his own), points us to a superb article in AFJ by Daniel L. Davis outlining the very real possibility that our immense advantages over our foes in the last two-plus decades has left many of our middle and senior leadership untested and overconfident in our warfighting capabilities. Imagine one of today’s division commanders finding himself at the line of departure against a capable enemy with combined-arms formation. He spent his time as a lieutenant in Bosnia conducting “presence patrols” and other peacekeeping activities. He may have commanded a company in a peacetime, garrison environment. Then he commanded a battalion in the early years of Afghanistan when little of tactical movement took place. He commanded a brigade in the later stages of Iraq, sending units on patrols, night raids, and cordon-and-search operations; and training Iraq policemen or soldiers. Not once in his career did an enemy formation threaten his flank. He never, even in training, hunkered in a dugout while enemy artillery destroyed one-quarter of his combat vehicles, and emerged to execute a hasty defense against the enemy assault force pouring over the hill. Spot-on. Such sentiment applies to ALL SERVICES. Even in the midst of some pretty interesting days in Ramadi and Fallujah, I never bought into the idea that was being bandied about so casually that “there is no more complex decision-making paradigm for a combat leader than counterinsurgency operations”. It was utter nonsense. The decisions to be made, as the author points out, above the troops-in-contact level, were seldom risking success or failure either in their urgency or content. We had in Iraq and in AFG the ability to largely intervene with air or ground fires as we desired, to engage and disengage almost at will, against an enemy that could never have the capability of truly seizing tactical initiative. Defeat, from a standpoint of force survival, was never a possibility. To borrow Belloc’s observations of Omdurman, “Whatever happens, we have got, close air support, and they have not”. At some of the Combat Maneuver Training Centers, Army forces do some good training. Some of the products and suggestions from Army Training and Doctrine Command are good on paper. For example, we often tout the “world class” opposing force that fights against U.S. formations, and features a thinking and free-fighting enemy. But I have seen many of these engagements, both in the field and in simulation, where the many good words are belied by the exercise. For example, in 2008 I took part in a simulation exercise in which the opposing forces were claimed to be representative of real world forces, yet the battalion-level forces were commanded by an inexperienced captain, and the computer constraints limited the enemy’s ability to engage. Many may remember the famed “Millennium Challenge 2002” held just before Operation Iraqi Freedom. Retired Marine general Paul Van Riper, appointed to serve as opposing force commander, quit because the exercise was rigged. ”We were directed…to move air defenses so that the army and marine units could successfully land,” he said. ”We were simply directed to turn [air defense systems] off or move them… So it was scripted to be whatever the control group wanted it to be.” For the U.S. Army to be successful in battle against competent opponents, changes are necessary. …Field training exercises can be designed to replicate capable conventional forces that have the ability to inflict defeats on U.S. elements. Such training should require leaders at all levels to face simulated life and death situations, where traditional solutions don’t work, in much more trying environments than is currently the case. They should periodically be stressed to levels well above what we have actually faced in the past several decades. Scenarios, for example, at company and battalion level where a superior enemy force inflicts a mortal blow on some elements, requiring leaders and soldiers to improvise with whatever is at hand, in the presence of hardship and emotional stress.Simulation training for commanders and staffs up to Corps level should combine computer and physical exercises that subject the leaders to situations where the enemy does the unexpected, where key leaders or capabilities are suddenly lost (owing to enemy fire or efforts), yet they still have to function; where they face the unexpected loss of key communications equipment, yet still be forced to continue the operation. Such exercises should not all be done in nicely compartmentalized training segments with tidy start and end times, and “reset” to prepare for the next sequence. Instead, some exercises should be held where there is a beginning time “in the box” and no pre-set start or end times until the end of a rotation two weeks or more later. In short, the training rotation should replicate the physical and emotional stress of actual combat operations in which there is no “pause” to rest and think about what happened. I couldn’t agree more. However, in a budget-crunch environment where significant funding is going toward advancing political and social agendas even within DoD, I am not at all sanguine about such training occurring. Worse, rather than having leaders champion the need for it and constantly fight for training dollars, I fear that such a requirement will be dismissed as less than necessary, since we already have “the most professional, the best educated, the most capable force this country has ever sent into battle.” While our soldiers, sailors, airmen, and Marines are indeed superb, and honed at the small unit level, our senior leadership is much less so. What’s worse is that leaders who have no experience in battlefield command against a near-peer force have begun to assert that technological innovation makes such training superfluous. That the nature of war has changed, and we are now in an era of “real-time strategy” and “global awareness”. To steal a line from The Departed, there is deception, and there is self-deception. Anyway, the Armed Forces Journal article is a thought-provoking read. Author XBradTC2Posted on February 22, 2014 Categories Afghanistan, Air Force, armor, army, ARMY TRAINING, Around the web, Artillery, budget, China, Defense, girls, guns, helicopters, history, infantry, iraq, logistics, marines, navy, planes, Politics, SIR!, Splodey, Uncategorized, veterans, war26 Comments on Seduced By Success; An Army Leadership Untrained for True War? UPDATE: Okay fine. Brad posted it already back in June. Watch it again, anyway. As per SOP, I watched the really good movie that XBRAD posted earlier, and in looking at zenoswarbirdvideos.com, found this one. My Father was an 18-year old Machinist Apprentice who made both landings shown in the film, Arawe on 15 December 1943, and Cape Gloucester on 26 December. His LCT 172 was a 105 foot craft somewhat larger than an LCM-8. (You see LCT 174 at some point in the video.) Part of his responsibilities was to go in ahead of the assault and mark water depth on the landing beaches, then paddle back out to the LCT and make the landings themselves. Anyway, on a cold and snowy Saturday afternoon, grab a cuppa and have a watch. The film is pretty gritty, and hardly paints a romantic picture of the war in the South Pacific. Locklear: US Pacific Dominance “Diminishing”? You don’t say, Admiral! Commander of US Pacific Command Admiral Sam Locklear seems to not have much of a knack for strategic thought. Last March it was Locklear whom, in the face of a sabre-rattling North Korea and an intransigent and increasingly hostile China, defined his biggest strategic threat to be…… climate change. Recently, at the Surface Navy Association, Locklear again puts a round in the wood with his convoluted and childishly naïve assessment of The People’s Republic of China, after finally having the long-overdue epiphany that China actually represents a threat to US interests in the Pacific and elsewhere. “China is going to rise, we all know that,” Adm. Locklear said, as reported by Defense News, which included several quotes from his speech at the annual Surface Navy Association meeting. Not that Locklear is alone in his Pollyanna take on the PRC. More than a few times, in wargames, and in discussions of events in the Pacific, I have heard senior officers discuss “co-opting” China as a “partner” to help “find a solution” to the problem, when the problem was very intentionally created by China and Chinese actions, because a change in status quo was in China’s best interests. But Locklear has PACOM. The People’s Republic of China is in his AOR. Locklear’s bizarre assertions have gotten notice, finally. “The problem with this formulation is, for whom does Adm. Locklear think China will be providing security?” said Dean Cheng, an analyst at the Heritage Foundation. “The implicit answer is ‘to everyone,’ because the assumption is that we can somehow mold China into being ourselves — that China will see its interests as somehow congruent and coincident with those of the United States, and therefore China will assume the mantle of regional provider of public goods. A couple of news flashes for Sam Locklear. China is not in a position to rise. They ARE rising, and have been for some years. The epiphany you had about China ending US dominance? A little late. By almost a decade. China has been an unabashed supporter of DPRK bellicosity and intransigence, and has materially aided them in both weapons development and network exploitation capabilities. They have undermined and eroded the Iran sanctions. China has been long involved in penetration of US networks and theft of national and industrial secrets, as well as many tens of billions of dollars of intellectual property. China has also made her intentions brutally clear on several occasions, in myriad ways. Unfortunately, political being that he is, Sam Locklear is deaf to the sounds of a regional adversary playing power politics when his civilian masters deny that power politics even exist (except domestically, to get elected). China as a force to be reckoned with has been something past Administrations have had to deal with, for sure. Not all of them (Loral?) have done so prudently. The continued shrinking of the US Navy under George W. Bush prevented a major US maritime presence in the Western Pacific while two wars unfolded in the Middle East. But what has happened since January 2009 has been an emboldened China seeing a reluctant and amateurish Unites States foreign policy that lacks resolve and is determined to cut the very capabilities which would be most useful in deterring Chinese expansion in WESTPAC at the expense of our allies. China smells blood (and opportunity), has greatly accelerated its efforts to establish complete regional hegemony, and has met with next to no opposition from the United States. The US acquiescence to the Chinese ADIZ is a case in point. Which is why you see Japan, and the Republic of Korea, India, and even the Philippines scrambling to build sufficient naval and military power to oppose China . Those nations, all of the US allies, see a vacillating and irresolute America befuddled by the rules at the grown-up table. American response to China’s increased aggression has been decidedly muted, while China’s proclamations of sovereignty over vast areas of the Pacific, and its military and diplomatic measures to cement that sovereignty have gone largely unchallenged. The US, it is perceived, lacks the will to stand up to China. Few indicators make that as clear as appointing someone like Sam Locklear to command PACOM. Patrick Cronan at CNAS verbalizes it well. Patrick Cronin, senior director of the Asia-Pacific Security Program at the Center for a New American Security in Washington, recently told The Washington Times that the U.S. is facing “a long game” when it comes to China. So when Admiral Locklear says “Our historic dominance that most of us in this room have enjoyed is diminishing, no question”, the first response that comes to mind would be that of my Senior Drill Instructor. “NO SH*T, Sherlock! What was your first clue?” But this isn’t Marine OCS, and Locklear isn’t working a squad tactical problem. Unfortunately, clueless as he is, he is a symptom of the disease, which permeates Foggy Bottom and the Pentagon. I do hope the illness is not fatal. Author XBradTC2Posted on January 17, 2014 Categories Air Force, army, Around the web, budget, China, Defense, history, Iran, iraq, logistics, marines, navy, obama, planes, Politics, Uncategorized, war7 Comments on Locklear: US Pacific Dominance “Diminishing”? You don’t say, Admiral! The USMC has been mulling this around for a while. Here is an article from the Marine Gazette from Vince Goulding in 2009. Note that the CoLT concept includes a platoon of M777 155mm howitzers, and a very robust ISR capability. And lots of comms for calling in supporting fires should it come to that. The pages are JPEGs, so you can click on them to make them a bit easier to read. I think we will be working with this concept for Expeditionary Warrior coming up in February. We’ve blogged from time to time on the wonderful revolution in logistics the simple metal box known as a shipping container. And Think Defence is the go-to resource for defense container blogging. gCaptain, of course, features container shipping news prominently. And now The Atlantic is getting into it. McLean understood that a transition to container shipping would require the complete redesign of the entire freight transport infrastructure: rail cars, ships, trucks, cranes, dockyards, everything. As a starting point, he commissioned the container engineer Keith Tantlinger to design a new aluminum container, and to reconfigure a decommissioned tanker vessel, the Ideal-X, to accommodate the new containers. Tantinger also developed a further piece of equipment, the container spreader bar, which enabled the container to be lifted without the need for stevedores to attach roping. As the economist and historian Marc Levinson has noted, the design of the spreader bar meant that “once the box had been lifted and moved, another flip of the switch would disengage the hooks, without a worker on the ground touching the container.” Container freight was all about increasing the speed of movement and reducing the cost of labor. Although the Ideal-X sailed for the first time as a container vessel in April 1956, it was not until 1970 that the International Organization for Standardization (ISO) agreed on the standardized sizes and certain fixings for containers (or ISO Containers as they are formally named). Cheaper labor is often cited as one reason why so many US manufacturing jobs have been sent overseas. That is, to be sure, a primary reason for such offshoring. But it wasn’t until the transportation costs of importing those goods fell that the combined costs of labor and transportation declined to a point that made economic sense. And it was the reduced manpower needed to utilize intermodal containerized transportation, and the reduction in time spend handling goods between modes of transport, that reduced those transportation costs. It is those traditionally peripheral economies, those in the not at all distant past that were at best marginally industrialized, and at worst almost wholly subsistence level agrarian, that have benefited from the expansion of production from the First World to the Third. So we’ve seen societies develop industry that allows their citizens to improve their quality of life. When well meaning liberals deplore the sweatshop conditions in some foreign land, don’t forget that the real alternative isn’t conditions and salaries comparable to our society, but rather a regression to poverty and starvation. Sadly, it seems a period of substandard conditions are a necessary transition before an evolving society can further improve to the point where wages, workplace safety, and environmental considerations can take a more prominent place in those societies. And many here will bemoan the loss of manufacturing jobs here in the United States. But the fact is, in our every more industrialized and automated world, many of those jobs would have disappeared anyway, as domestic manufacturers decided to either reduce their workforce via robotic manufacturing, or simply abandon production. Further, by virtue of those peripheral nations growing their economies through manufacturing, they actually serve to strengthen our own economy. These nations, formerly with little capital to purchase goods, were economic backwaters. But as they industrialize, they become markets for our own production- machine tools, construction equipment, steel and other processed metals, information and communications infrastructure, airplanes, and other high end manufactured goods that remain our productive strength. In many cases, the domestic and European markets are saturated, so finding new Third World markets for these products is critical to maintaining our levels of production, and thus wealth generation. Quite often the first step for a nation on the path to prosperity is the exploitation of natural resources. Sadly, any number of nations have limited resources worth export or other exploitation. Further, in those societies that do have resources, their lack of development also tends to mean they lack the civic, government, and legal institutions that prevent the exploitation of natural resources from being concentrated in the hands of a gentry with no legitimate claim to the wealth beyond raw power. That wealth then tends to be hoarded, rather than reinvested entrepreneurially, strangling any further economic development. It is only when these developing nations turn to the processing of resources into goods that they become truly the fuel of trade, rather than mere export. I fondly recall my time in the Republic of Korea for Team Spirit ‘87. ROK was just transitioning from a strong-arm authoritarian government to a genuinely representative government. Many of its people still lived in farming communities that looked more like the 1800s than the late 20th Century. But as they liberalized their government, they were also focused greatly on improving their industrial capacity, both in heavy industry such as shipbuilding, and in consumer goods such as electronics, and even into the cutthroat US auto market. The country’s successful leverage of its human capital to add value through manufacturing allowed it to trade, and to continue to grow, improving the lives of its citizens. The shipping container made it profitable for nations to buy products from Korea where previously shipping costs would have been prohibitive. That a simple metal box has had such an impact on the lives, however indirect, on the poor and downtrodden of so many millions around the world is stunning.